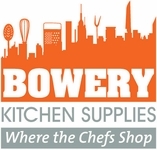 Shop with the top Restaurant chefs and professionals as well as Food Network STARZ at Bowery Kitchen Supplies We opened for business on the famous Bowery Street Restaurant Supply Street in 1975, supplying New York's finest Restaurants, Bars, Lounges, Deli's, Bakery, Pizzerias & Caterers! 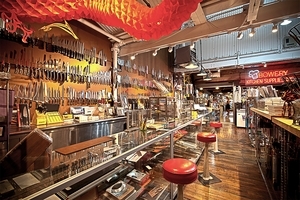 Located at The Chelsea Market since 1996 also home to The Food Network Studios where Emeril Live and many popular shows are filmed. Rachel Ray and many other celebrity chefs shop the store while filming It is so exciting to serve and support our neighbors the Food Network, stars of the culinary arts, as well as supply the kitchen behind the scenes. Check out our media section with great photos and more of visiting celebrities and more. On a daily basis the on-stage personalities and talented chefs in hundreds of kitchens in New York use our cool gadgets and traditional chef tools to create feasts for the stomach as well as the eyes. Visit us and experience the market yourself. Holiday and special hours will be posted here. 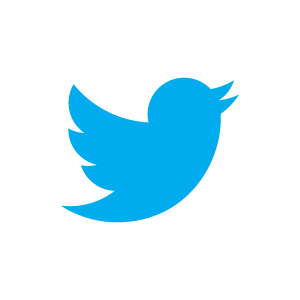 You can email us with a question or request for quote at Bowerykitchen@mac.com.